KIVU – When Jémima Masika, 26, lost her parents to Ebola in August, she thought the deadly virus was a myth – then she fell sick herself. The Democratic Republic of the Congo is no stranger to Ebola. This is the country’s tenth Ebola outbreak – but it is the first time the densely populated province of North Kivu, an active conflict zone, has been affected. Masika contracted the disease while taking care of her sick aunt. “I was helping my aunt, and she was vomiting a lot. I had to clean after her several times. Then, after, I began to feel unwell. I was having the same clinical signs as the ones that my aunt had,” she explained. The outbreak started in August, striking the provinces of North Kivu and Ituri. More than 800 cases have been identified, and more than 500 people have died. Women and girls, as traditional caretakers for the sick, face an increased risk of exposure. According to the World Health Organization’s most recent report about the outbreak, about 58 percent of Ebola cases have been female. And Ebola’s impact spreads far beyond those infected. Strained health-care systems have left many without access to life-saving services, including sexual and reproductive health care. UNFPA has been working with partners to prevent the spread of the virus and to help ensure sexual and reproductive health services remain available. In September, UNFPA donated 10 tons of medical equipment intended for 20 health facilities in Beni, enough to assist 31,000 people for 6 months. Included in these materials were supplies that allow women to give birth without risk of contracting the disease. UNFPA is also helping midwives exercise precaution while tending to mothers and newborns. But efforts to respond to the outbreak have been hampered by instability in the region, which has put humanitarian teams at significant risk. Community mistrust has also been an issue. To address this, UNFPA has been engaging the community with information about the virus. “We are delivering a comprehensive response to the Ebola epidemic that includes outreach to provide communities with essential information for preventing and controlling the disease,” said Sennen Hounton, UNFPA’s representative in the country. “We were told about Ebola and what to do if you were feeling certain symptoms. So as a precaution, I went to the Ebola treatment centre,” Ms. Masika recalled. She was quickly diagnosed with Ebola and admitted for treatment. “I was so afraid to die and be put in a body bag, just like my parents were,” she said. Few had expected her to pull through. “I found out that my family had given away all my belongings, as they thought I was not going to recover,” she said. 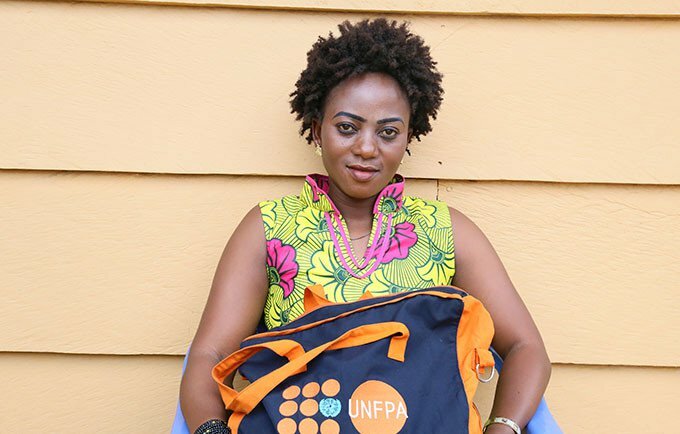 Upon discharge, Ms. Masika received a UNFPA dignity kit, which contains essential hygiene supplies. Hygiene plays a critical role in preventing the spread of the virus. “As a cure for Ebola, I have committed myself to help others by sensitizing them on how they can observe the rules of hygiene, in particular by washing their hands to protect themselves against the disease,” Ms. Masika declared. More than 77,000 people have been reached with a mass vaccination campaign since August. UNFPA provided supplies for this effort, including 10,000 syringes. UNFPA also helped fortify water, sanitation and hygiene services in affected areas, and is provided more than 50 motorcycles as well as software to support contact tracing – the monitoring of people who have been in contact with infected persons. And UNFPA has sponsored a football tournament, theatrical activities and a march of more than 1,000 students, all activities supporting the health ministry’s awareness-raising campaign “Ebola not at home”.